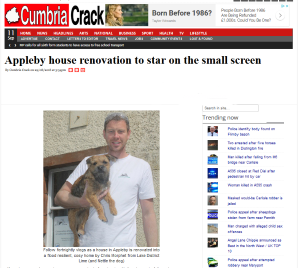 A traditional building in the Appleby Heritage Action Zone (HAZ) is filming its ‘work in progress’ as part of work grant aided by Historic England, posted on YouTube, as reported by Cumbria Crack! If you love a good property programme, you’re in for a treat, with the chance to follow along as a house in Appleby undergoes a very clever renovation. Starting next month, you can tune into fortnightly video diaries and watch as 33a Chapel Street is transformed from an uninhabited house that was previously flooded, to a warm and cosy home that’s ready for rain in the future. The owners of this 1800s terraced house have chosen to renovate it in a way that makes it more resilient to flooding while taking into account how older, solid-wall buildings are designed to work. They’ve given permission for the build to be filmed by a professional film-maker, so that anyone living in older properties or in a flood-risk area can pick up tips to help them improve and adapt their buildings, too. The professional vlogs will start in September, and meanwhile you can see the house and get introduced to some of the people involved in a short video made by CAfS – including Nettle, the Lake District Lime dog! It’s available on the CAfS YouTube channel now, with ongoing updates on CAfS social media using #ReadyForRain.